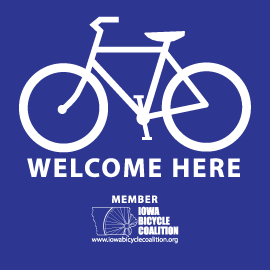 Bicycles welcome here is our new initiative to reach out to businesses across Iowa. The more businesses we have supporting our mission, the more power we have to achieve better bicycling conditions. If more business take the step toward becoming bicycle friendly, the more encouragement and opportunities individuals have to dust off their bikes and ride whether it’s commuting to work or for fun. Business have the chance to play a large role in increasing our bicycle friendly ranking nationally. We are asking all businesses in Iowa to take this chance and pave the way to a better, healthier and happier Iowa. Show your Support and Invest in the Future of Iowa!